In a small saucepan, add sugar and 1 c water, and heat over medium high. Stir to combine and cook for 5 minutes, or until sugar has completely dissolved. Remove from heat and let cool. Add grapefruit juice, Champagne vinegar, Champagne and pepper, and stir to combine. Pour mixture into a 9x13-inch baking dish and place in freezer for 8 hours or overnight. Use a fork to scrape the mixture up into shaved ice. 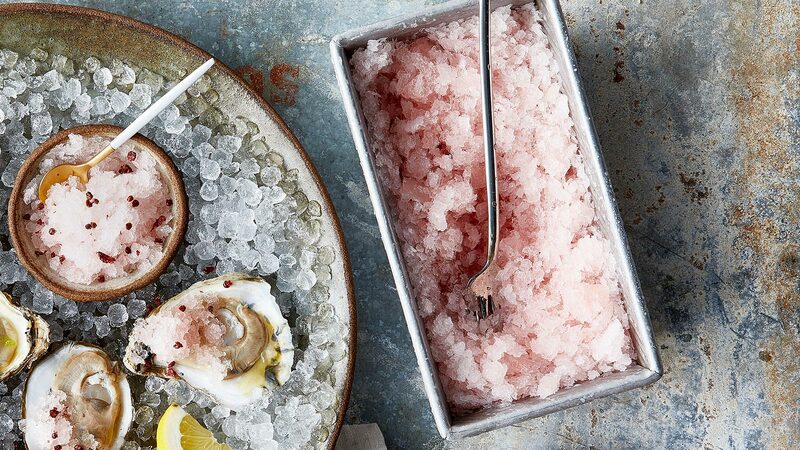 When ready to serve, drag fork across the surface and scoop the ice into a serving dish or atop fresh oysters. Store any remaining granita in freezer (it will keep for several months).